AVS Video Recorder can transfer, record, capture, encode with AVS Video Recorder. Transfer video to hard drive. Digitize your old VHS tapes. Encode video directly to MPEG-2 or MJPEG or AVI formats and leave free space on your computer. Record live video. AVS Video Recorder is a free application from AVS4YOU package. Transfer video from VHS camcorders and VCR to your computer. Give new life to your old VHS tapes with AVS Video Recorder. ...... Leave free space on your hard drive. 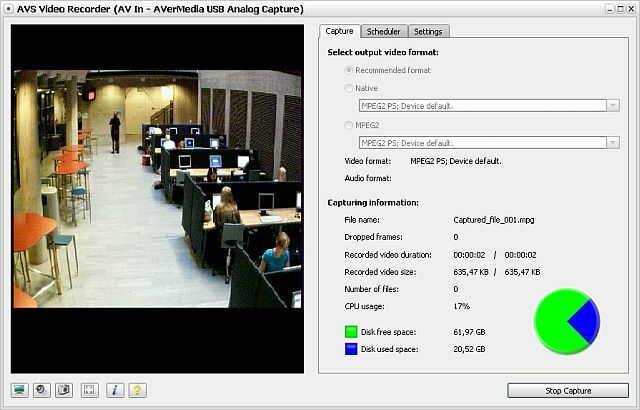 Transfer your video files from HD-cameras and record them in camera native format or in MPEG-2 with AVS Video Recorder . Record and save live video on hard drive and encode it in MPEG-2 or MJPEG format with AVS Video Recorder . Transfer video from VHS camcorders and VCR to your computer. Give new life to your old VHS tapes with AVS Video Recorder . Save video on your hard drive in lightweight MPEG-2. AVS Video Recorder interface and tech-support are available in English, French, German, Spanish and Italian. Edit your MPEG video files fast and lossless with AVS Video ReMaker. Qweas is providing links to AVS Video Recorder 2.4.1.40 as a courtesy, and makes no representations regarding AVS Video Recorder or any other applications or any information related thereto. Any questions, complaints or claims regarding this application AVS Video Recorder 2.4.1.40 must be directed to the appropriate software vendor. You may click the publisher link of AVS Video Recorder on the top of this page to get more details about the vendor.